First of all, there is no excuse for my laziness in the last month. I was really lacked of motivation. Incomplete transcriptions have been stacked on one another without reaching a point of near perfection. Each time I speed up, I feel so void in what I was trying to do. Everything seems to stop completely. The truth is I know my limited capability is hard to handle such a huge amount of request now. Each time I finish a sheet, each time my expectation for perfection goes up. However, my slow improvement couldn’t race with my expectation; hence, I felt so frustrated and irritating. Time by time, more and more people will visit my blog and know about me. The increments of number (views, likes, subscribers, followers, etc.) somehow are not encouragement but rather, expectation. The more expectation I have from people, the more I feel unease. I simple whisper to myself: I am not born to be a person bringing music to the masses. I cannot bear the popularity and huge expectation from audience. “Turn blind and keep walking”, simply as that. 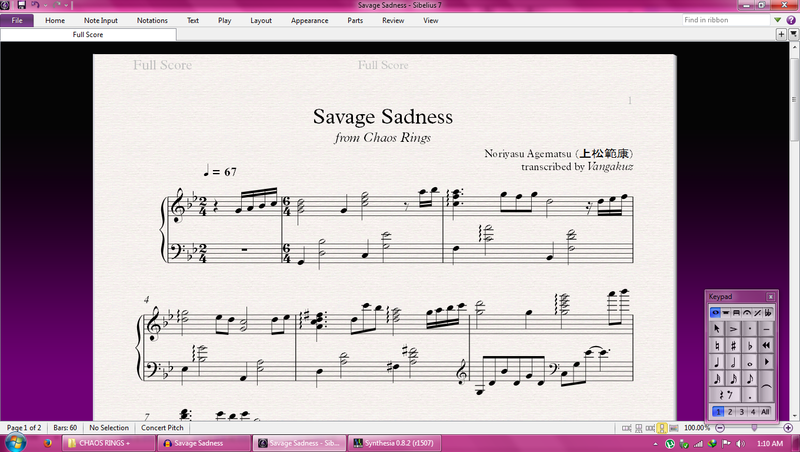 “Savage sadness”, a soundtrack from the game Chaos Rings, fully depicts my feeling now. Sorry for just a long waiting for requester, it is time again for doing request and this time the winner is Eric requesting Aishita onna from G-Sensou no Maou. Yesterday, I coincidentally listened to the whole OST collection of G-Sensou no Maou and were stunned by Aishita onna and its other variations. 1. Aishita Onna, hardest variation with fastest tempo. 2.Michi ha Hyouga Nari, slower variation. 3. Aizou no Nare no Hate, easiest version. Here is the deal, the final set will all 3 sheet, midi and audio of all variation. By the way, all G-Sensou no Maou OST is very challenging. I have some talks to my friends, some other Anime transcribers and most of them was afraid to arrange them. Announcement: “Mischievous of Alice” is still in progress. Last week, I received the request from Chris Perusch (CrimsonSali) to transcribe this. And now, the set is perfect complete. The production of this video was unexpected because I had no intention of the first place of covering this sorrow piece. Yesterday, I exhausted myself to arrange “Mischievous of Alice” (sung by Yosei Teikoku) and almost gave up on that challenging project. “Never stain yourself on music!” I recalled. I decided to choose a requested song and at that time, because of the exhaustion, I picked the easiest among 5 requests. The truth is this piece was not so impressive to me at first time I heard it. I still don’t know what happened when I finished the score in only 2 hours and about half an hour to practice and record. However, when I was recording, I felt the sorrow of those melody. It seemed like they and my heart synchronized together. I felt relieved, peaceful and yet rejuvenated. Oh, there are music that can only be fully appreciated by play them. Special thank to Chris Perusch who requested and entrusted me to transcribe. Well, I finally worked things out all weekend and yesterday, I managed to record my first video using Synthogy Ivory for the audio. Synthogy Ivory has done excellent – stunning -amazing job making my crappy digital piano become unique. For that, I now temporarily accept my piano capabilities instead of buying a better one or looking to other grand pianos and feeling jealous. Oop, sorry to mention that I accept the first request: Hitomi wo Tojite #2 (G-Senjou no Maou OST) When I received the request and had the first hearing, I thought: “Hmm, the melody is really strange, rushing and depressed. But wait a bit, the more I listen to it, the more and more I love its painful theme. This piano solo piece have a particular strong right-hand pressure. Each melody note is so bright and strong like each needle hitting your heart. But you know what, I love that pain. Furthermore, the tempo is varied at some part. It makes me imagine of being chasing, I was running as fast as I can to reach something so far away and probably never possibly reach it. When the tempo is slow, I feel like I were exhausted of running. Anyway, the piece is hard to describe. I feel a lot of emotion from it and I do love it. Ah, I remember that I played G-Senjou no Maou long time ago and did not finished not because I didn’t like but because I got sleepy from reading. I do think that the game is good. Check out now! My YouTube pianist debut video! 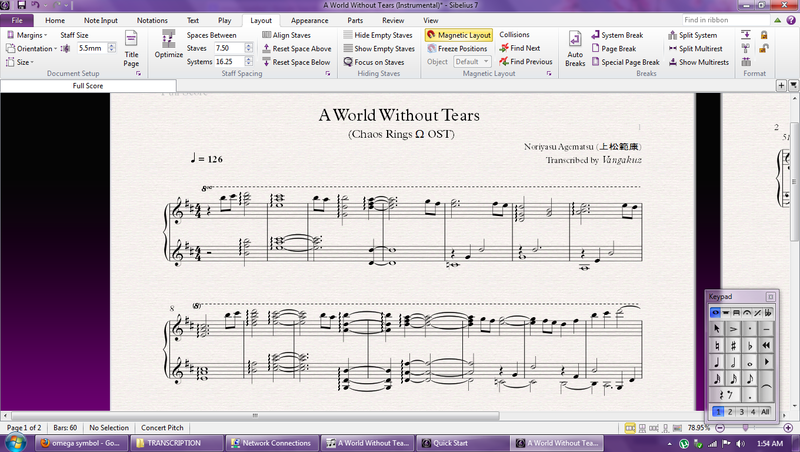 A World Without Tears (Chaos Rings Ω OST) sheet is on the “Transcription” tab. It’s has been decided. “A World Without Tears (a song from the game Chaos Rings Ω)” is my current exact transcription. “A World Without Tears” is so depressingly beautiful and is one of my favorite. It fits perfectly to the atmosphere of the game. Chaos Rings Ω, for me, is the best RPG mobile game. Hopefully, I will finish this masterpiece perfectly and as soonest possibly and release my first recording.